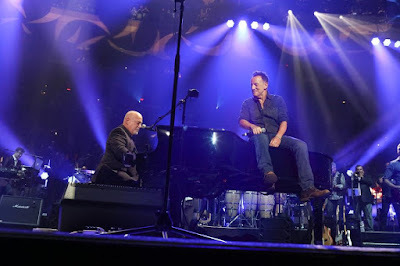 Bruce Springsteen made a guest appearance during Billy Joel’s 100th concert at New York’s Madison Square Garden on July 18. Springsteen, who hit the stage mid-way through the singer’s 26-song set, congratulated his friend on the milestone event before they launched into a pair of classics from the New Jersey rocker’s breakthrough album, “Born To Run”, including “Tenth Avenue Freeze-Out” and the project’s iconic title track. Joel has played sold-monthly shows at the New York venue since he began the first and only arena-sized residency in music history there in 2014. Springsteen, meanwhile, continues his intimate “Springsteen On Broadway” series at the city’s Walter Kerr Theater, with shows running to mid-December. “I wanted to do some shows that were as personal and as intimate as possible,” said Springsteen last summer when he announced the original dates last fall. “I chose Broadway for this project because it has the beautiful old theaters which seemed like the right setting for what I have in mind. In fact, with one or two exceptions, the 960 seats of the Walter Kerr Theatre is probably the smallest venue I’ve played in the last 40 years.